The summer's hitting, the sun is shining, and I'm thinking about last year's exploits in Chicago. It's obvious that I adore a few certain breweries if you're an avid To Love and to Drink reader, and so much of me wishes this wasn't the last Goose Island post I had up my sleeve. 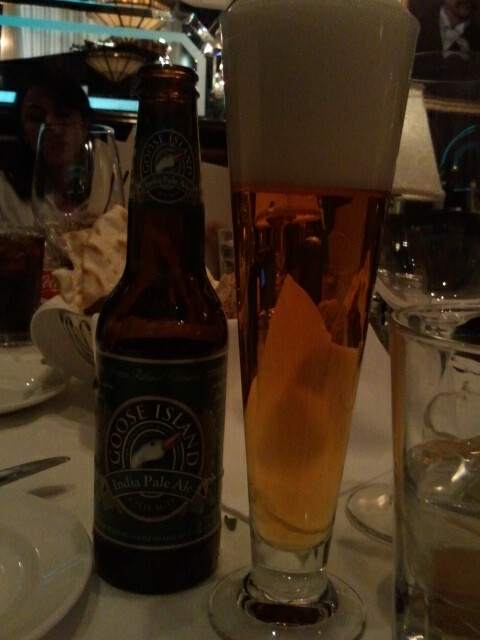 I had Goose Island's IPA at Capital Grille just off E Ontario Street in Chicago. I'll never forget the taste of this beer, and its one of my go-to's in Chi-town. Clean, hoppy, smooth, very subtlety fruity. Oh, so good. It's 5.9%, 55 IBU, light to medium golden, and has a gorgeous citrus taste that's not overbearing; oh, and it's amazing with thai food. If anyone's on their way from Chicago to Toronto, and feels like picking up a few brews to share (with me!) this is one I'd choose. Yes, yes please. Did I mention it's got Cascade hops?